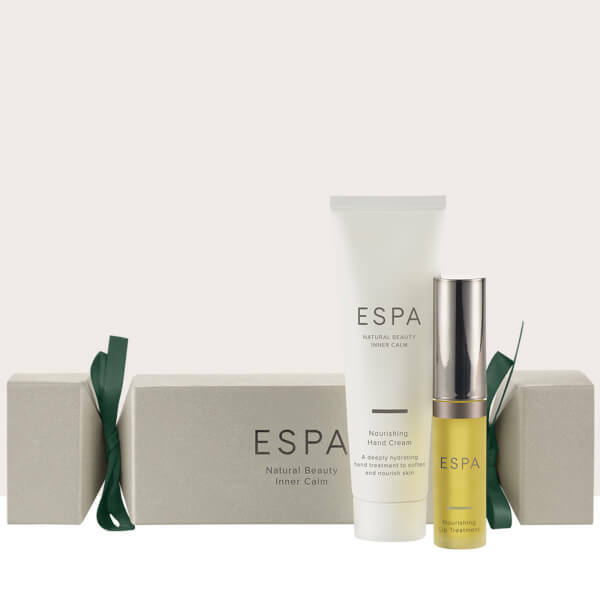 Treat yourself or a loved one to ESPA's Joyful Treats, a duo of nourishing skincare treats dedicated to nurturing your hands and lips. Housed in festive Christmas cracker packaging, it's the perfect pampering present to leave the skin and senses feeling calmed and replenished. A deeply hydrating and luxurious hand cream laced with a Ginger and Pink Pepper essential oil blend. Protecting skin against the cold winter chill, the ultra-rich hand cream envelops hands in a cocoon of nourishment and moisture, leaving skin feeling soft, supple and restored. A protective and intensely hydrating treatment oil for lips. The nourishing solution contains Indian Gentian to promote smoothness, and a blend of Hyaluronic Acid and Konjac Root that plumps lips with moisture to enhance hydration and minimise the appearance of fine lines. Perfect worn alone or as a glossy top coat over your favourite lip colours. Hand Cream: Massage into hands as often as required. Lip Treatment: Apply throughout the day as required or as a glossy topcoat over lip colour. For an intensely nourishing boost, apply to the wider lip area before bed. Lip Treatment: Oleic/Linoleic/Linolenic Polyglycerides, Ricinus Communis (Castor) Seed Oil, Vitis Vinifera (Grape) Seed Oil, Polyamide-8, Squalane, Ethylhexyl Palmitate, Isopropyl Palmitate, Punica Granatum Seed Oil, Rubus Idaeus (Raspberry) Seed Oil, Limonene, Citrus Paradisi (Grapefruit) Peel Oil, Helianthus Annuus (Sunflower) Seed Oil, Lecithin, Citrus Aurantium Bergamia (Bergamot) Fruit Oil, Citrus Aurantium Dulcis (Orange) Peel Extract, Citrus Aurantifolia (Lime) Oil, Citrus Limon (Lemon) Peel Oil, Water (Aqua), Trihydroxystearin, Rosmarinus Officinalis (Rosemary) Leaf Extract, Swertia Chirata Extract, Pentaerythrityl Tetra-Di-T-Butyl Hydroxyhydrocinnamate, Elettaria Cardamomum Seed Oil, Mentha Arvensis Leaf Oil, Pogostemon Cablin Leaf Oil, Rosmarinus Officinalis (Rosemary) Leaf Oil, Linalool, Citral, Barosma Betulina Leaf Oil, Cymbopogon Flexuosus Oil, Sodium Hyaluronate, Tocopherol, Amorphophallus Konjac Root Powder..